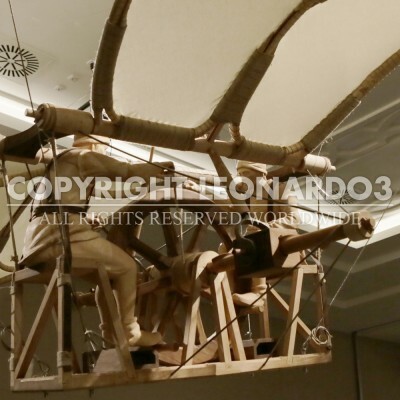 As in the case of the “flying bicycle” the term tandem bicycle could seem misleading, given this vehicle was unknown in Leonardo’s time, but the idea to use two drivers evokes the modern wheeled vehicle. Two people are used to produce more energy to make the machine work. 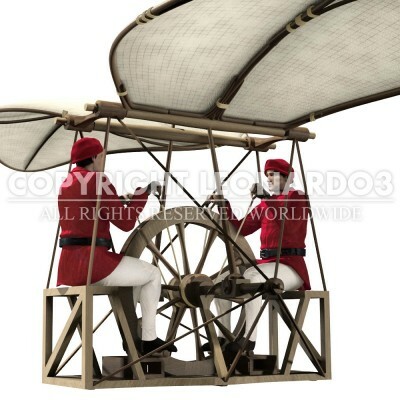 As in the case of the “flying bicycle”, moving the central wheel causes the wings to flap in this design too. Because the effort exerted by the two pilots would have been so intense, Leonardo intuited the need to give one of the pilots a rest every so often. Clearly it would have been impossible for any of the designs drawn on this folio of the Codex Atlanticus to take flight.